As climate change has emerged as an issue challenging the future of society, faith-based groups have joined many others in examining the role that their values and world perspectives can play in responding to climate change. This is particularly true of the Bahá'í community whose perspective on world unity naturally inclines it to support unified action. The International Environment Forum, a Baha'i-inspired organization for environment and sustainable development, has organized or co-sponsored a series of conferences and events on the ethical dimensions of, and the response to, climate change in Oxford, Ottawa and New York. These conferences aimed to motivate the public and Bahá'í communities to recognize the linkages between climate change and other priority issues such as development, gender balance, economic policies, education, community action and individual lifestyles, combining scientific approaches and the spiritual dimension. They defined an important role for faith-based communities in responding to the ethical challenges raised by climate change and proposed possible ways forward. The major conclusions will be summarized in the paper. The Baha'i Faith (http://www.bahai.org/) is the newest of the world religions and the second most geographically widespread after Christianity. Its central aim is the oneness of humanity, which naturally inclines it to support unified action, including the United Nations (where it has been accredited since 1948) and associated processes including the UNFCCC. One of its basic principles is the harmony of science and religion, so for many years, it has been particularly attentive to environmental and conservation issues, including climate change and its ethical dimensions. The International Environment Forum (IEF) was founded in 1997 as a Baha'i-inspired professional organization for addressing the environment and sustainable development (https://iefworld.org/). Now with over 200 members in more than 50 countries, many with advanced degrees in environmental sciences, the IEF provides a platform for its members to explore the relationship between ethical and spiritual principles and the environmental challenges facing the world. The IEF functions as a virtual organization, using the Internet and the world wide web to network among its widespread membership. It organizes annual conferences on themes relevant to the environment and sustainability, and has been active in the UN Decade of Education for Sustainable Development. In 2002, it was accredited to the UN World Summit on Sustainable Development in Johannesburg, where it participated in the Science Forum and organized several parallel activities. It is a partner in various educational activities such as the Certificate of Advanced Studies in Sustainable Development at the University of Geneva, and contributes to the European Union's Consumer Citizenship Network (http://www.hihm.no/concit/). With the rising urgency of action to respond to climate change, the IEF naturally began to focus on the issue with several conferences and other events relating the science to broader social and ethical considerations. These activities aimed to motivate the public and Bahá'í communities to recognize the linkages between climate change and other priority issues such as development, gender balance, economic policies, education, community action and individual lifestyles, combining scientific approaches and the spiritual dimension. They defined an important role for faith-based communities in responding to the ethical challenges raised by climate change in harmony with science, and proposed possible ways forward. The major conclusions are summarized below, and full reports, papers, presentations and audio/video recordings are available on the IEF web site (https://iefworld.org/). This was the 10th IEF annual conference, organized in partnership with the Bahá'í Agency for Social and Economic Development of the United Kingdom (https://iefworld.org/conf10.htm). The conference considered climate change from scientific, economic, social, gender, development and community perspectives. Speakers included Dr. Halldor Thorgeirsson, Deputy Executive Secretary of the UN Framework Convention on Climate Change, Dr. Augusto Lopez-Claros, then Chief Economist at the World Economic Forum, and various scientists and academics. 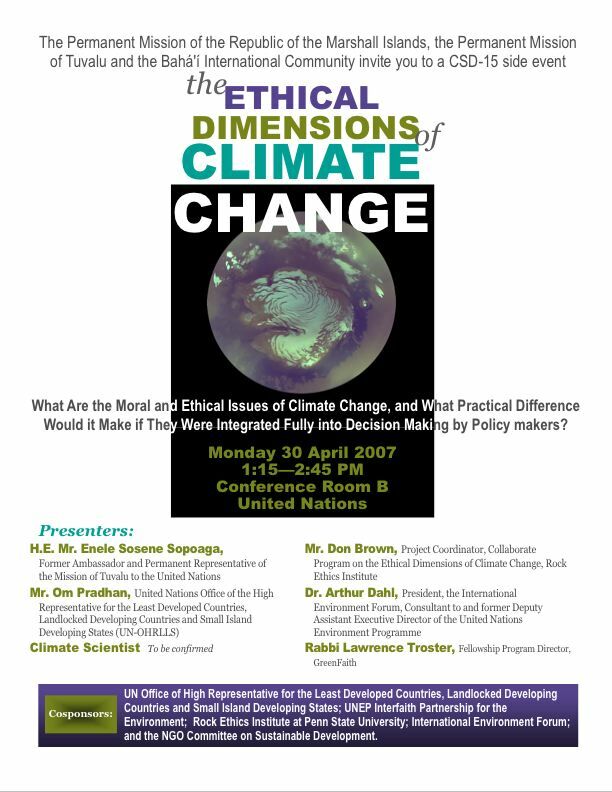 One of the papers at the conference on "Climate Change and its Ethical Challenges" was later published in The Baha'i World 2005-2006, the official record of the Baha'i community. (https://iefworld.org/ddahl07a.htm). The conference placed the failure of present institutions to address climate change in the larger perspective of social divisions and fundamental imbalances in present society. Climate change is a consequence of our materialistic economy and consumer society. Unity is an essential prerequisite for action, accepting the oneness of humankind and our fundamental responsibility for environmental sustainability. There is a common ground for all religions to strengthen the ethical framework for responses to climate change. In the face of the disproportionate impact on the poor and developing countries, a North-South community is required. There are significant gender differences, with women both more vulnerable to climate change, and with strengths to respond, so gender issues should be taken into account in climate change. Given the local-global links between energy use and climate change, there was a lack of global energy governance, and a need for a fundamental shift in the material structures of society. The policy framework established by governments for both economic and environmental policies was important, with a high correlation between commitment to the environment and business competitiveness. The conference concluded with workshops on the importance of the community level and individual change to create opportunities for business change. As one speaker put it, if you are not part of the solution, you are part of the problem. This official side event on Monday 30 April 2007 was organized by the Bahá'í International Community with the Permanent Missions of Tuvalu and of the Marshall Islands, and co-sponsored by the UN Office of High Representative for the Least Developed Countries, Landlocked Developing States and Small Island Developing States (UN-OHRLLS); the UNEP Interfaith Partnership for the Environment; Rock Ethics Institute at Penn State University; International Environment Forum; and the NGO Committee on Sustainable Development. The event, held in the UN Building on the first day of CSD-15, filled the room with over 90 people, including the Minister and other delegation members from Tuvalu. There were presentations by H.E. Mr. Enele Sosene Sopoaga, Former Ambassador and Permanent Representative of Tuvalu to the UN, Mr. Om Pradhan of the UN-OHRLLS, Mr. Tony Barnston of the International Research Institute for Climate and Society, Columbia University; Mr. Don Brown of the Collaborate Program on the Ethical Dimensions of Climate Change, Rock Ethics Institute; Dr. Arthur Dahl of IEF; and Rabbi Lawrence Troster, Fellowship Programme Director of GreenFaith. The event was covered in full page articles in the two CSD newsletters, Outreach Issues for Tuesday, May 1, page 6 (download pdf from http://www.anped.org/index.php?part=112) and ENB on the side ( http://www.iisd.ca/csd/csd15/enbots/pdf/enbots0511e.pdf) and video recordings of all the speakers were posted on YouTube ( http://www.youtube.com/profile_videos?user=martha04032). An article was also published in One Country ( http://www.onecountry.org/e191/e19104as_CSD_story.html). The event brought to the attention of governments the work being done by both academic and faith-based groups to explore the ethical questions relevant to the climate change negotiations and the role of ethical principles in finding a basis for agreement. This conference was held in collaboration with the Bahá'í Community of Canada (https://iefworld.org/conf11.htm). It explored the relationship between ethical and spiritual principles and the practical actions of individuals and communities facing global environmental change. The location was chosen because Arctic communities are some of the first to be severely impacted by climate change, and an ethical and spiritual approach can help them to cope with the forced transformation of their environment and lifestyle. Speakers included scientists such as Professor John Stone, a committee Vice-Chair of the Intergovernmental Panel on Climate Change, Dr. Arthur Dahl (Switzerland) and Dr. Sylvia Karlsson (Finland), theologians such as Prof. Heather Eaton and Rev. Dr. Ted Reeve, and representatives of civil society and indigenous communities. Based on the clear evidence of the science, the focus was on the moral responsibility to act to prevent further climate change. The adaptation argument was not morally defensible, as illustrated by the profound impacts on Inuit life and culture. The general population was way ahead of governments in their appreciation of this. The inertia of the world industrial economy was creating great vulnerability to the collapse of civilization. For example, how can we maintain and feed the world population without the energy subsidy from fossil fuels? There is a need for new ethical foundations for a just social order with an economy that is altruistic and cooperative, creating employment and eliminating poverty. Religions have much to offer in the transformation of self, social and ecological ethics, and reconnecting with the sacred in the beauty and elegance of the natural world. Religions are in transformation and need to become scientifically literate, re-examining their world views, seeing our interdependence and the interweaving of matter and spirit. There is a need for a spiritual reawakening to the earth. Energy poverty is due to the unequal distribution of fossil fuels, but renewables are everywhere. While governments have resisted international energy governance, it was needed to mediate conflicts, facilitate the transition to renewables, and address global disparities. National energy governance should focus on rules and regulations, investment patterns and subsidies. Governments face a number of ethical questions, and should draw on the relevant spiritual principles or values. The energy sector is closed, male-dominated, and corrupt because so much money is available. There is a lack of trust and trustworthiness that makes agreement difficult. Presentations explored business opportunities in the response to climate change, and faith-based actions like greening sacred spaces. Individuals should learn to live with less energy, and many practical examples were discussed. It was necessary to recognize the links between environmental choices and faith teachings, and to develop moral capabilities such as empathy, sufficiency, courage and diversity of response, including through the education of children. 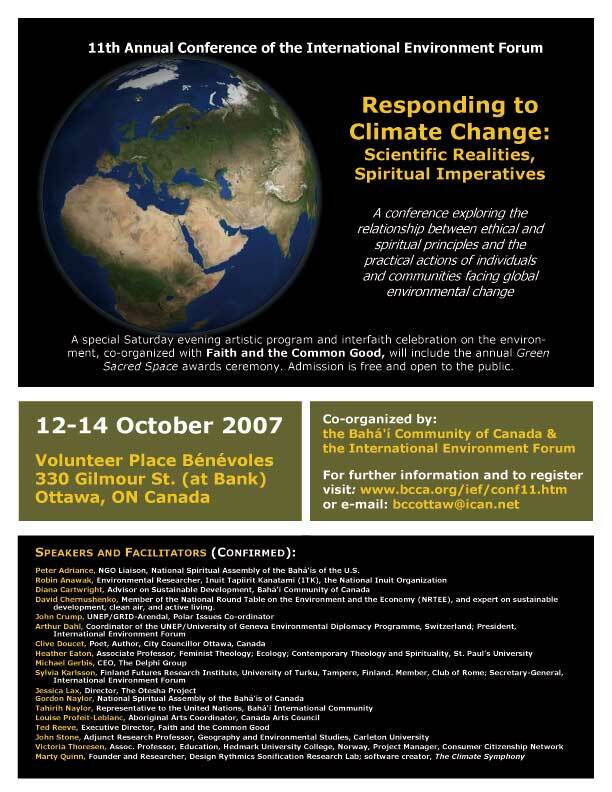 One result of the conference was a letter from the Canadian national Baha'i administrative body to all its local communities calling attention to the pressing global challenge of climate change and asking them to demonstrate ever-increasing sensitivity to environmental issues in the design and implementation of community activities. The whole Saturday morning of this annual conference was devoted to climate change, with presentations on the science of climate change (Dr. Arthur Dahl), the political dimensions (Dr. Halldor Thorgeirsson), the involvement of the Baha'i International Community (Tahirih Naylor-Thimm) and the response of the Canadian Baha'i community (Duncan Hanks), followed by a panel response to audience questions. The full audio recordings are available on the conference and IEF web sites ( http://www.bcca.org/ief/el/elpresent.htm#ClimateChange). The Baha'i International Community is now preparing a Seven Year Plan of Action on Climate Change reflecting a Baha'i perspective as part of an initiative of the Alliance of Religions and Conservation and the United Nations Development Programme for a joint presentation of the response of religions to climate change in the lead up to the Copenhagen Climate Conference in December.